Terma Alex ONE designer electric towel rails provide an independent heat source for bathrooms, kitchens, and en-suites - as well as keeping towels warm and ready for use. Featuring simple, push-button controls, using the Terma Alex is easy and it even comes with a 2-hour timer function. Styled with gently rounded bars and a soft grey finish, the Alex adds a designer accent to any space. Download or view the Alex 500 x 1580mm assembly instructions & technical drawing here. Alex electric towel rails are rated IPX5 and must be professionally installed by a qualified electrician in a suitable bathroom location. Always defer to the manufacturer’s guidelines about the bathroom suitability of any product. For further installation information, please see the Terma Alex mounting guide and product dimensions. Terma Alex Designer Electric Towel Rails offer a minimalist, low-key aesthetic for style-conscious homes. 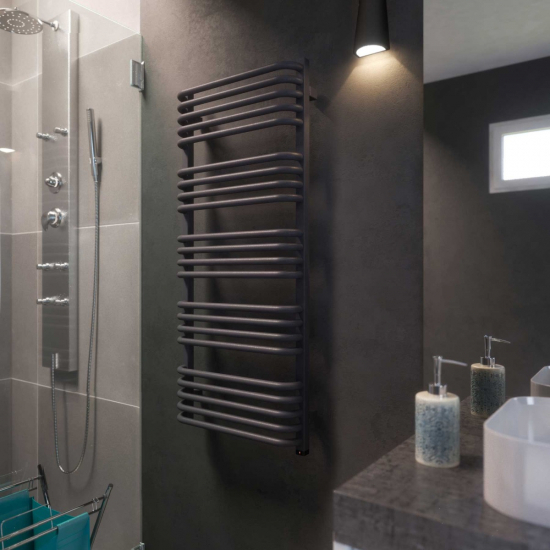 Blending easy to use controls with contemporary style, Alex towel rails provide the perfect finishing touch for modern bathrooms.